Sculpture must be suitable for outdoor public display. It should be stable and free-standing. Artists will be expected to install their own sculptures within the designated time frame and remove them the week after the tour ends leaving the site in its original condition and to have the necessary proofs of insurance. An electronic submission or a CD/DVD should be labeled with the name of the artist. It should have at least 3 images of the sculpture. Each image must be a PC-compatible JPEG file at 300 dpi, as close to but not larger in either dimension than 750 pixels. Each JPEG file must be named in the following format – “last name_title_view #.jpg” – where the artist’s last name is followed by underscore, title of artwork, underscore, view number (1, 2 or 3), file extension. (jpg) Please do not present your work as a montage of images (ie., in a PowerPoint file); each image must be a separate JPEG. Artist is responsible for transport, anchoring system, installation of the sculpture, and removal after the tour leaving the site in its original condition and will require all the necessary insurance. We will notify you if your work is accepted. Sculptures can be made available for sale or rental. The sculptures will remain on exhibit for at least 1 year. Each chosen work will receive an honorarium. An artists reception/ vernissage will be held. 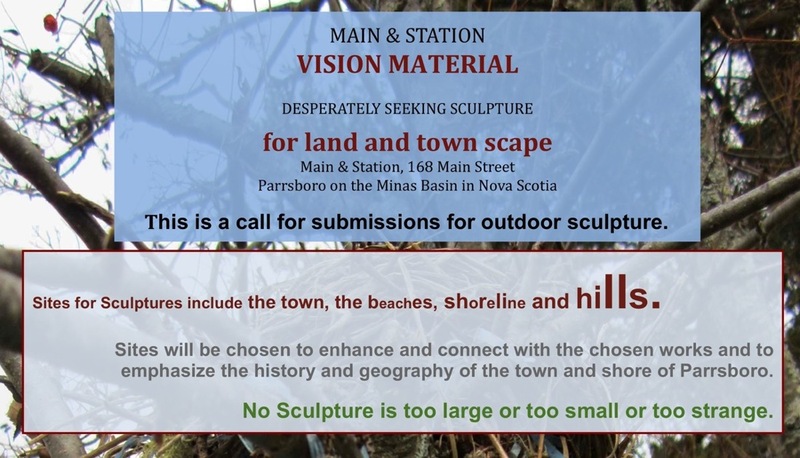 This entry was posted in Art and tagged ART, call for submissions, contemporary art, Parrsboro, Sculpture by Admin. Bookmark the permalink.